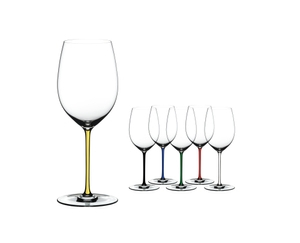 The exceptional handmade Cabernet and Merlot glass of the eye-catching glass collection Fatto A Mano stands out due to a yellow stem. This glass showcases the majestically structured red wines in all their complexity and finesse. Combining the sophistication of handmade glass in the style of the ancient Venetian tradition with the very latest glass making technology. All RIEDEL glasses are dishwasher safe.